The Department of Physiology and Pharmacology was formed on July 1, 2002 from the merger of the Department of Physiology and the Department of Pharmacology and Toxicology. This coincided with the recruitment of Dr. J.L. Henry to Western University as Chair of the Department. With the departure of Dr. Henry in December 2004, Dr. R.J. Rylett was appointed as the current Chair. The Department of Physiology and Pharmacology draws upon the unique strengths of the former Departments, and has evolved the academic programs and administrative functions to fit the current needs of the Department and to respond to future challenges and opportunities. As you will read below, both parent departments have a rich history and an excellent record of success. In the early years of the Medical School at Western, there were not individual academic Departments. Teachers were part-time, and a Professor was elected for each subject that was taught in the medical curriculum. Lectures, some demonstrations, and rudimentary student laboratories were offered. Dr. F.R. Eccles was Professor of Physiology from 1882 until shortly after the medical school relocated to a site at the corner of York and Waterloo Streets. He was replaced by Dr. H.A. McCallum, who was followed by Dr. J.B. Campbell as Acting Chief of Physiology from 1903 until 1914. In 1914, the Medical School entered a new era with establishment of seven Departments, Anatomy, Medicine, Obstetrics and Gynecology, Pathology, Pharmacology, Physiology and Surgery, each with a full professor. Dr. F.R. Miller was appointed as the first full professor of Physiology in 1914. World War I delayed further development of space and facilities, but in 1921 the Medical School moved to a larger and more modern building on South Street. By that time, Professor Miller had put the teaching of Physiology on a professional basis. He was involved in research as well as teaching, and he excelled in both. He initiated student laboratory instruction that included both human and animal experimentation. Miller was one of the first Professors to combine good teaching with productive research. He was also one of the first classical neurophysiologists who was able to bridge the technological gap between mechanical and electrical recording techniques. He earned international recognition for his studies of electrical activity in mammalian motor and cerebellar nervous systems. Dr. G.W. Stavraky joined the Department in 1936 as a Lecturer. He was well-known for his work in gastrointestinal physiology, and he made many contributions to both undergraduate and graduate teaching. The Department at that time was also dependent on part-time instructors drawn from the ranks of clinical staff, with one notable example being Dr. Frederick Banting. During World War II, the increased use of air warfare spawned a host of studies on the effects of rapid acceleration and high altitude flight on humans. The Department of Physiology, along with the Department of Pharmacology, became actively involved in aviation physiology, with decompression chambers for use with human subjects being designed and installed in the medical school. Research on this topic continued into the late 1960s. There was a large increase in student enrolment at Canadian universities in 1945 following the war. The medical school at Western, now known as the Schulich School of Medicine & Dentistry, responded by extending the academic year to accommodate the large Veterans Classes and even held some summer sessions. The Government increased university funding, and teaching facilities were expanded allowing the medical class to increase to 60 students. 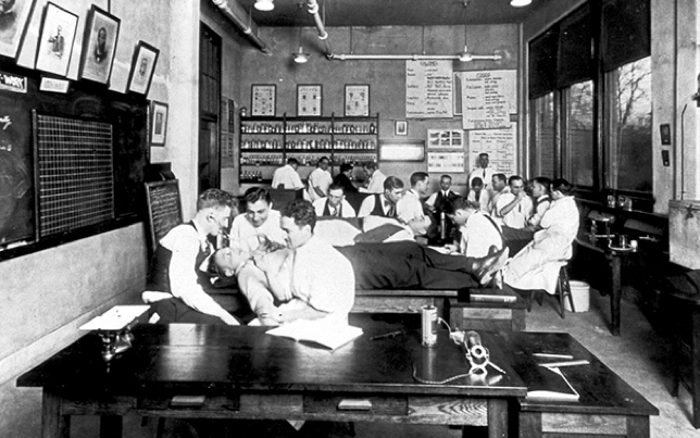 The teaching laboratories of the Department of Physiology and the Department of Pharmacology were combined at this time, beginning a cordial arrangement that lasted for many years. This was also a time of large changes in senior faculty staffing in most departments. Professor F.R. Miller was appointed to one of the newly-established positions of Research Professor in 1947, and was succeeded as Head briefly by Professor O.E. Edholm, who returned to England in 1949. Dr. R. Noble became Acting Head until 1951. In 1951, Dr. J.A.F. Stevenson was appointed Professor and Head of the Department of Physiology, and he served with great distinction for 19 years until he became Dean of the Faculty of Graduate Studies. During his tenure, major changes took place in the Faculty of Medicine. This included a move from South Street to the newly-built Medical Sciences Building on the main campus of Western University. Also, the number of full-time faculty members was increased, and teaching and research programs were reviewed and strengthened. Faculty members planned their own office and laboratory space, with Professor Stavraky making his new office an exact replica of his old one in the South Street building. The number and size of lecture rooms were doubled, whereas student teaching laboratory space, still shared by Physiology and Pharmacology, was limited but better equipped. The teaching commitment of Physiology was expanded to include students in the Faculties of Physical Education, Nursing and Science. An Honours BSc in Physiology was also established with the first class graduating in 1969. 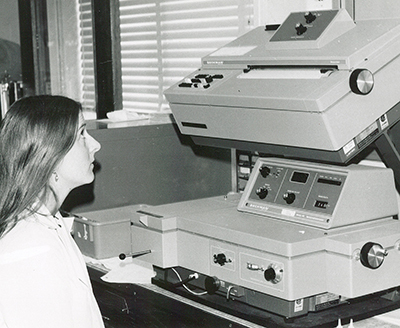 In 1967, the dental school opened, thus alleviating the chronic shortage of space in the Department of Physiology and the Department of Pharmacology with creation of new teaching laboratories, and offices and laboratories for faculty members. With his resignation in 1970, Dr. Stevenson was the last Professor of Physiology to hold the title of Head, as in 1968 the position of Head were replaced by Chairs with five-year terms. Dr. G.J. Mogenson was Acting Chairman of Physiology from 1971-72, during a time when the teaching commitment of Physiology spanned the Faculties of Medicine, Dentistry, Nursing , Science, Physical Health and Education and Social Sciences. The number of full-time faculty members in the Department increased to ten, all of whom had full-time research programs in addition to their teaching. In 1972, Dr. V. Brooks was appointed as Chairman of the Department and formed a group to study Motor Control Activity in primates. This was one of the several research groups in the Department, including the Reproductive group under the direction of Dr. D. Armstrong. The discipline of Pharmacology at the Western University traces its roots to 1882 with the creation of a Chair of Materia Medica under the auspices of the newly-founded Medical College of Western University. The associated discipline of Toxicology can be traced to 1907 when a Professor of Toxicology taught medical students about poisons. The Department of Pharmacology was founded in 1914 with Dr. J.M. Crane serving as Head from 1915-1934. He was succeeded by Dr. R. Waud who directed the Department until 1960. After completing a D.Phil at Oxford, Dr. Charles W. Gowdey became Head of the Department in 1960 and retained that position until he stepped down in 1981 subsequently retiring in 1986. Under the guidance of Dr. Gowdey, the Department entered an expansion phase with the focus being on neuropharmacology. This was promoted in 1961 with recruitment of Dr. J.T. Hamilton as a Lecturer, and Richard B. Philp and Lewis W. Hersey as graduate students. Drs. Hamilton and Philp subsequently received faculty appointments in the Department of Pharmacology, while Dr. Hersey was cross-appointment between the Departments of Pharmacology and Anaesthesia. 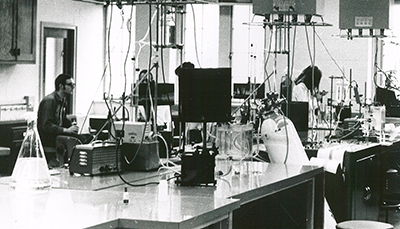 Expansion continued with recruitment of the neuropharmacologists Dr. E.H. Colhoun in 1965 and Dr. J.M. Parker in 1966. 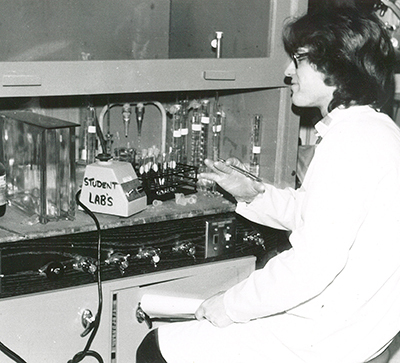 Dr. M. Hirst, a chemical neuropharmacologist, joined the Department in 1968, and Dr. M.A. Cook, also a neuropharmacologist, and Dr. D. Mills, a hematological pharmacologist arrived in 1974. Dr. Mills subsequently left in 1976 to become the Drug Information Officer at Victoria Hospital. The Department began to diversify in 1980 with the appointment of Dr. E.M.K. Lui, a biochemical toxicologist. At this time, the Department's name was changed to Pharmacology and Toxicology to reflect the growth of toxicological research and extension of the Department's teaching mandate. In 1981, when Dr. Gowdey resigned as Head, Dr. Philp was appointed Chair, leading development of the research and teaching activities of the Department until 1986. Dr. M.P. 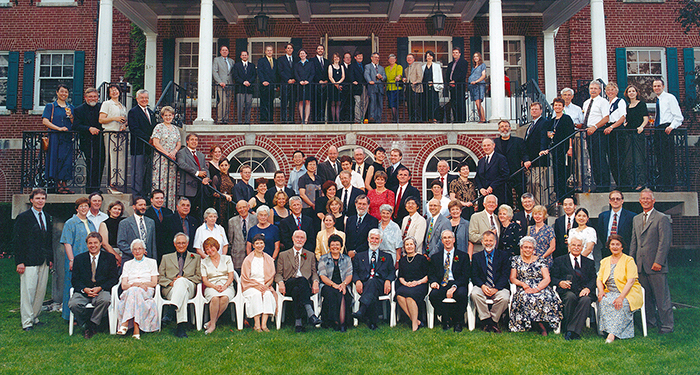 Moffat joined the Department in 1985, stimulating cardiovascular pharmacology as another of the Department's areas of research strength. Dr. J.R. Bend, a molecular pharmacologist/toxicologist, accepted the position of Chair in 1986, after having served as Chief of the Laboratory of Pharmacology at the U.S. National Institute of Environmental Health Sciences (NIH). Another period of expansion and diversification followed, with the recruitment of Dr. J.R. Hammond, a molecular/cellular pharmacologist, in 1988, Dr. M. Karmazyn, a cardiovascular pharmacologist, in 1989, and Dr. T.R. Zacharewski, a molecular toxicologist, in 1992. Additional expansion of the faculty occurred with the recruitment of new molecular pharmacologists, Drs. P. Chidiac and L. Dagnino in 1998 and Dr. M. Tini in 2002. The Department of Pharmacology and Toxicology developed and maintained strong ties with other Departments through the cross-appointments of Drs. R.J. Rylett (Physiology), M.G. Cherian (Pathology), K. Tyml (Biophysics), J. Koropatnick and G. Hammond (London Regional Cancer Centre), T. D'Souza (Pediatrics) and A. Gelb (Anaesthesiology). The Department also enjoyed extensive interactions with members of the Clinical Pharmacology Division in the Department of Medicine. Clinical appointees Drs. M. Arnold, D. Bailey, J. Brown, R. Feldman, D. Freeman, R. Gerace, M.J. Rieder and D. Spence were all active in teaching and/or collaborative research with members of the Department of Pharmacology and Toxicology. 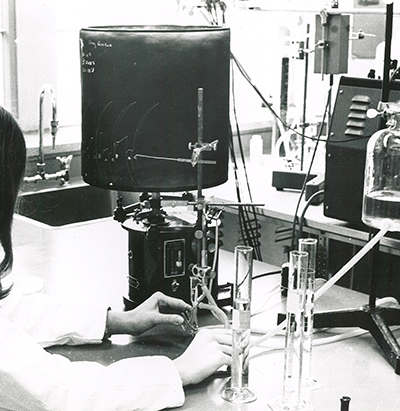 Toxicology received a boost in 2001 with the naming of Dr. G. Hammond as the Ivey Chair in Molecular Toxicology. This position was created by a generous donation from the Ivey Foundation. The mission of the Ivey Chair in Molecular Toxicology is to provide a focal point for research in Molecular Toxicology and to foster development of the Program in Drug and Environmental Safety. In 2001, Dr. M.A. Cook took on the role of Acting Chair and guided the Department through the steps leading to the merger with the Department of Physiology. At that time, the Department of Pharmacology and Toxicology consisted of 39 regular and cross-appointed faculty members, 7 Professor Emeriti, and 32 Honorary Lecturers, with an impressive range of research activities in the subdisciplines of biochemical and molecular toxicology, cardiovascular pharmacology, chemotherapy, clinical pharmacology, environmental toxicology, immunopharmacology, and molecular and cellular neuropharmacology.